September is the ideal time to visit the summer country homes of Russian poets and writers, many of whom occupied their estates all year round. The “autumn” writer Leo Tolstoy (born September 9, 1828, new style) lived and worked at his ancestral estate, Yasnaya Polyana, which is located 200 kilometers south of Moscow. There he wrote his famous novels “War and Peace” and “Anna Karenina,” among a great number of his other works. This is also the location of his burial site. The Yasnaya Polyana state memorial and natural preserve currently displays authentic furniture from the estate, Tolstoy’s personal possessions, his 20,000-book library, the work house of the writer Prince Volkonsky, the Kuzminsky House, which held a school that Tolstoy opened for peasant children, and a bathhouse. On the official site , you can find out how to get there, where to stay and how to book an organized tour (in English). The Boldino autumn (1830, 1833) was the most productive period in the working life of Alexander Pushkin, who during that time completed “Eugene Onegin” and “The Little Tragedies” and wrote more than 30 lyric poems. The seclusion in the village of Bolshoe Boldino, which is situated in the Nizhny Novgorod region (570 kilometers from Moscow), due to a cholera quarantine which coincided with his long-awaited marriage to Natalya Goncharova. In 1918, the residents themselves declared the village to be reserved Pushkin sites—a park and the poet’s favorite grove, the renovated estate, and a reconstructed patrimonial office have been preserved there. View the list of organized tours to Bolshoye Boldino here. Another site in European Russia is associated with the work of Alexander Pushkin: the Mikhailovskoe estate, which in the early 20th century became part of the Pushkinskie Gory state reserve along with the nearby Trigorskoe and Petrovskoe estates. The Pushkins’ estate was built at Mikhailovskoe in the 18th century by the poet’s uncle, Osip Gannibal. There the poet wrote the middle chapters of the novel “Eugene Onegin,” the tragedy “Boris Godunov” and other works. Now, this reserve, that lies 650 kilometers from Moscow, covers 9,800 hectares and includes five lakes; flood meadows and park areas near the estates of the poet’s relatives and friends; Pushkin’s grave and the family necropolis; and the scientific and cultural center of the Pushkinskie Gory community. A favorite autumn destination among Russians is the “house on the Oka,” the estate of Vasily Polenov, a national artist of the RSFSR. 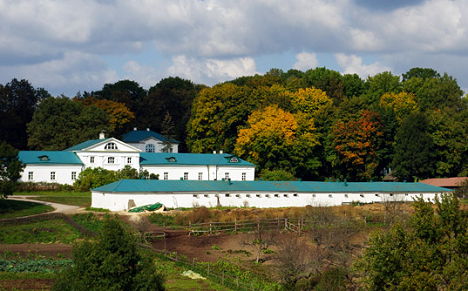 The estate was built more than 100 years ago and stands 130 kilometers from Moscow. The artist designed the main house, the artist’s “Abbey,” and the annexes, all of which are located on the estate, as well as St. Trinity Church, which is two kilometers away. Today the estate is a state museum-reserve covering 14 hectares and including 17 memorial buildings and a park on the grounds, where most of the trees were planted personally by the artist. You can travel independently to the estate via suburban trains Moscow–Tula, departing from the Kursky Railway Station in Moscow to Tarusskaya Station, then take a marshrutka (fixed-route taxi) or bus to Polenovo. A sightseeing tour is the best way to visit Polenovo. Sightseeing tours. The cost of the tour, including transfers from Moscow, ranges from 150 to 250 euros for adults, depending on the number of days and sites to be visited. Please, contact the tour department for information on all excursions and sightseeing tours. You can book a tour by phone or at the official website www.polenovo.ru – only in Russian. Tel. / Fax: 8 (487) 342-1180 Tel. : 8 (906) 702-5752 E-mail: exburo@polenovo.ru More information about the estate in English. Situated 76 kilometers from Moscow, the Abramtsevo manor estate, now a museum-reserve, belonged to the writer Sergei Aksakov and, later, Savva Mamontov. Thanks to Mamontov, the Abramtsevo estate became a center of artistic life in late 19th-century Russia. The estate welcomed a roster of guests that included the writers Gogol and Turgenev, the artists Repin, Vasnetsov, Vrubel, Korovin and Levitan, and the renowned bass singer Fyodor Shalyapin. Nowadays, the 50 hectares occupied by this museum-reserve contain a park and monuments to 18th- and 19th-century architecture. On the official site , you can find out how to get there, where to stay and how to book an organized tour. (http://www.museum-esenin.ru/) – the official website, only in Russian. You can reach it by taking the Express Train Moscow-Ryazan, or the electric train Moscow-Ryazan from the Kazansky Railway Station in Moscow to the Rybnoye Station, then by bus or a marshrutka (fixed-route taxi) (No. 132). Take a bus to Ryazan (No. 960) from the Vykhino Bus Station.